6.20. 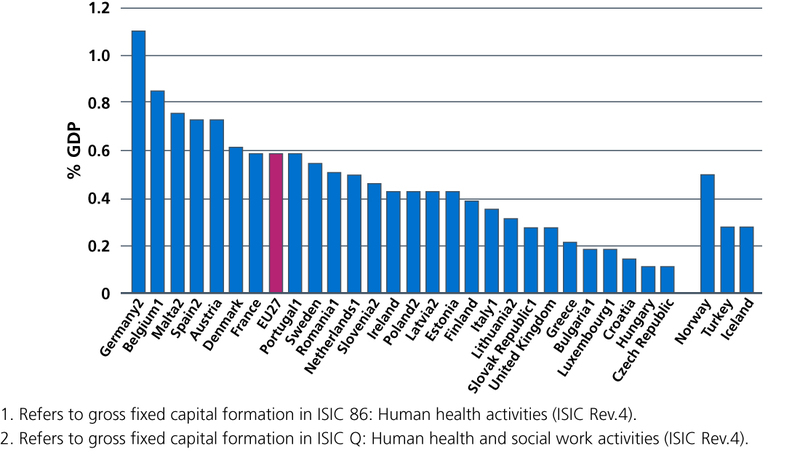 The NHS already uses its capital assets and infrastructure more intensively than most other western countries and, in recent years, has invested less capital than these other countries and our historic track record. Figure 28: Gross fixed capital formation in the health sector as a share of GDP 2016 (nearest year). Source: OECD. Health at a Glance 2018: Europe 2018. State of Health in the EU Cycle. November 2018. 6.21. Much of our estate consists of world-leading facilities that enable the NHS to deliver outstanding care for patients. But some of our estate is old, in parts significantly older than the NHS itself, and would not meet the demands of a modern health service even if upgraded. Equally, meeting our future aspirations will require our digital capability and diagnostic equipment to be enhanced significantly. At the Spring and Autumn budgets in 2017, the government announced an additional allocation of £3.9 billion to accelerate estates transformation, tackle critical backlog maintenance issues and support efficiency. All STPs now have estates plans to support their clinical and service strategies, and include proposals for a pipeline of possible capital investments. The Chancellor has confirmed that NHS long-term capital investment will be considered in the 2019 Spending Review. In return, we will continue to maximise the productivity benefits we generate from our estate, through improving utilisation of clinical space, ensuring build and maintenance is done sustainably, improving energy efficiency and releasing properties not needed to support the government’s target of building new houses. 6.22. We are also considering a number of reforms to the NHS’ capital regime to ensure capital funding is prioritised and allocated efficiently, supports the transformation of services and increased productivity, and allows for effective planning and control. These reforms will be set out in detail alongside the capital settlement at the Spending Review, and will remove the existing fragmentation of funding sources, short-termism of capital decision making and uncertainty for local health economies. As part of this work we will implement the forthcoming premises review for primary care.